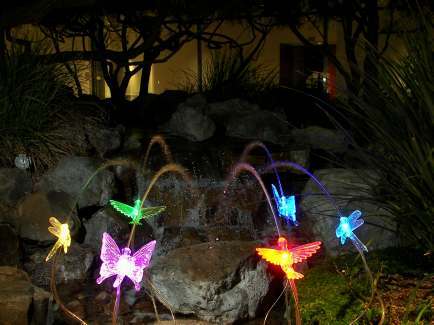 ﻿ Home - Garden Color Changing Water Spitters. 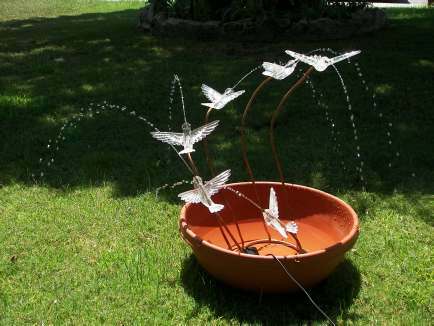 Sprink-L-ites™ are a natural for Water Features. By replacing the micro spray nozzles with simple through hole tips the versatile Sprink-L-ites™ are wonderful crystal clear spitters for water features. 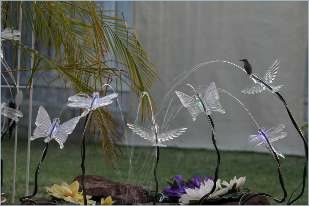 At home around a pool, pond, birdbath, fountain, or waterfall shooting a delicate stream of water attracting birds or creating a pleasant splashing sound Sprink-L-ites™ enhance the environment. 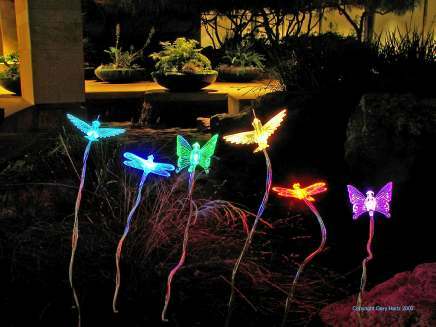 The Dragonfly spitters create a tropical or jungle effect even enhancing a desert cactus environment of southern Arizona. 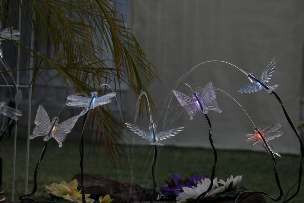 A landscape lighting display right on the waters edge or posed with water lily's, hovering over lily pads or flying around frogs, these accent lights create a whimsical aura. 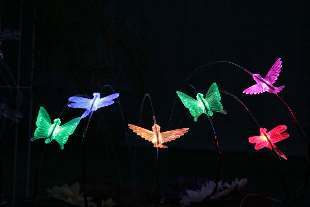 Any theme can be created using the crystal clear Butterflies, Hummingbirds, or Dragonflies. 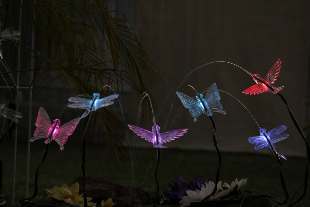 They sparkle and shimmer in the sunlight and create intense color changing hews at night adding a magical aura to the night time accent lighting display. 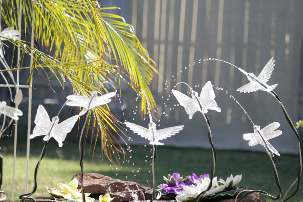 Someone once said the accent lights look like Swarovski Crystal sculptures the spitting water adds another dimension to the art. 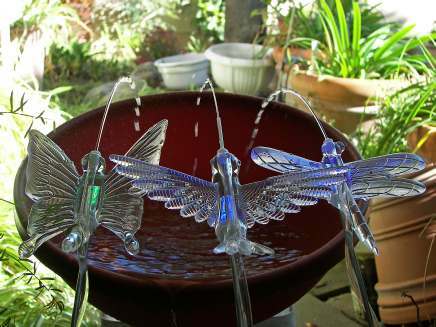 To my surprise the fine stream of water attracts Hummingbirds, they use the sculpture as a perch and stick their head into the stream, it is a wonderful site to behold, they love it and spend as much as 2 minutes bathing and flitting between the streams. 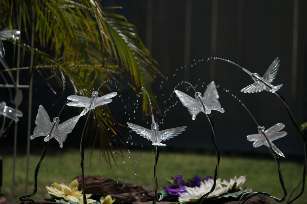 I have never seen anything like it and now it is my favorite pastime, watching the Hummingbirds play in the water and trying to photograph or video the display. What fun! NOW see how we have evolved.